Azure Service Health is extending its ability to help you stay informed about the availability of your Azure resources. Starting today, you can configure resource health alerts to notify you immediately when your resources become unavailable due to Azure platform issues, even before outages are declared. 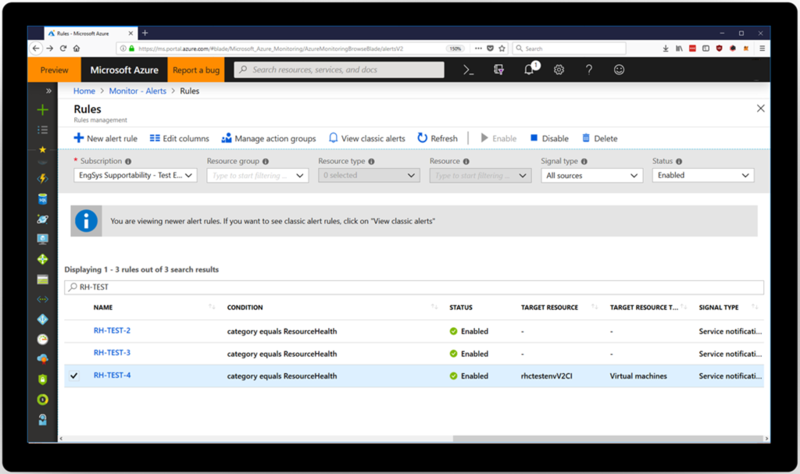 Resource health alerts take advantage of the Azure Activity Log and resource health data to provide you with prompt notifications as these events take place. Check out this video to get an overview and see a quick demo of these new resource health alerts. It’s easier than ever to stay informed about your resources’ availability, minute by minute, and to determine whether any issues you’re experiencing are due to a problem with you or with Azure. You can now configure resources health alerts to monitor your resources and notify you when they become unavailable, recover, or go through any health transitions. Additionally, you can choose to focus on platform-level issues by ignoring events which result from user-initiated actions like an Azure Virtual Machine (VM) restart. This way, you can find out about platform events even before outages are officially declared. You can manage how these alerts notify you by configuring them to send you an SMS, email, or push notification. You can even set up webhooks with downstream services like Service Now, PagerDuty, OpsGenie, and more. We provide detailed guidance on how you can programmatically create these alerts and configure them to fit your needs in our Azure Service Health documentation. 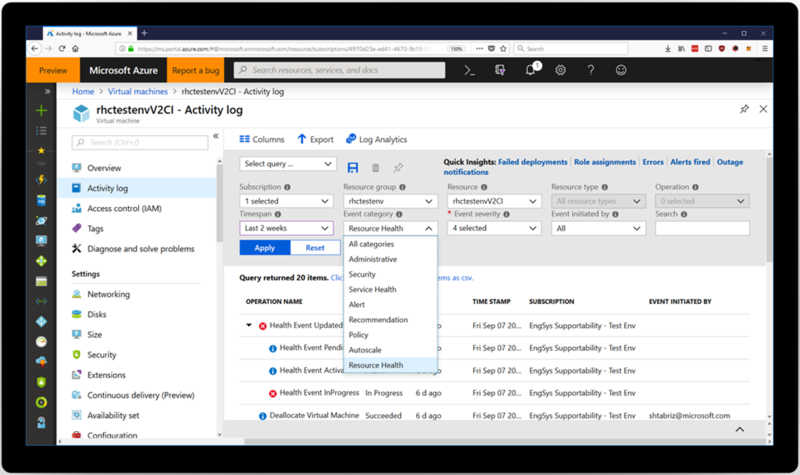 Resource health events are now stored and accessible through the Azure Activity Log. This means that you can automatically start ingesting this data into your downstream services like Log Analytics, Splunk, and more. Like other Activity Log events, you can now access resource health programmatically using our ARM Insights APIs. Resource health currently supports over 30 different resource types, and more will be added over time. Learn more about the resource health activity log schema. We know how important it is that you stay informed about the availability of your resources, and we hope these new features will help you stay aware and in control of the status of your Azure environment. To get started, visit the Azure Service Health webpage and review the Azure Service Health documentation today. As you dive in, we would love your feedback about your experiences. Reach out to us at servicehealth@microsoft.com.